The 18' Fire Marble Wet or Dry Slide has a smokin' hot look to go along with the wet fun it provides. 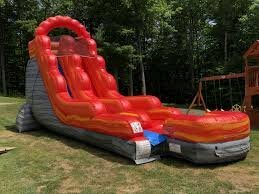 This 18 foot unit can be used as a water slide for hours of slipping and sliding fun on a hot day or turn off the water and it works perfectly as a dry slide. All of our wet and dry slides have an inflated landing zone for safe use. Our wet and dry slides feature a built in misting system, which is more durable than regular misting hoses with no parts to lose. Just insert your hose, tighten the velcro strap, and you are ready to go. The splash zone has built in drains on both sides to keep the water level ideal for all ages.